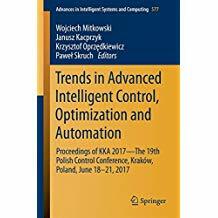 This volume contains the proceedings of the KKA 2017 – the 19th Polish Control Conference, organized by the Department of Automatics and Biomedical Engineering, AGH University of Science and Technology in Kraków, Poland on June 18–21, 2017, under the auspices of the Committee on Automatic Control and Robotics of the Polish Academy of Sciences, and the Commission for Engineering Sciences of the Polish Academy of Arts and Sciences. Part 1 deals with general issues of modeling and control, notably ﬂow modeling and control, sliding mode, predictive, dual, etc. control. In turn, Part 2 focuses on optimization, estimation and prediction for control. Part 3 is concerned with autonomous vehicles, while Part 4 addresses applications. Part 5 discusses computer methods in control, and Part 6 examines fractional order calculus in the modeling and control of dynamic systems. Part 7 focuses on modern robotics. Part 8 deals with modeling and identification, while Part 9 deals with problems related to security, fault detection and diagnostics. Part 10 explores intelligent systems in automatic control, and Part 11 discusses the use of control tools and techniques in biomedical engineering. Lastly, Part 12 considers engineering education and teaching with regard to automatic control and robotics.